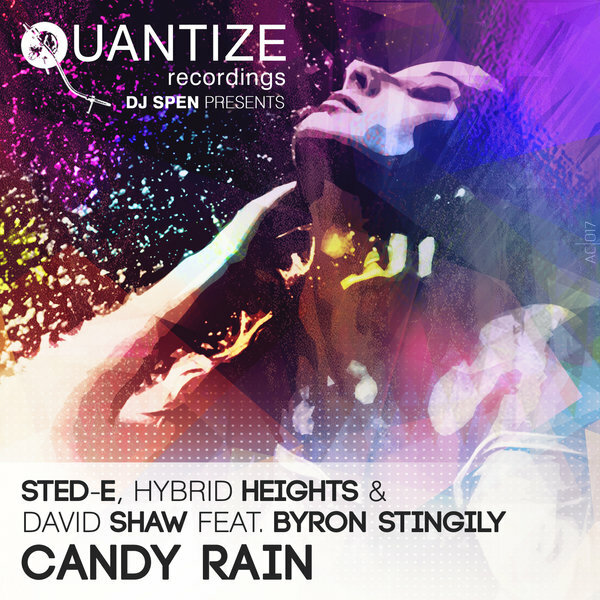 (P) 2017 Sted-E Rockin Music / Rosillo Ent / SMP Music Productions“Candy Rain” is an infectious slice of soulful house featuring former Ten City lead singer and house legend Byron Stingily. Written in conjunction with producers Sted E and Hybrid Heights (who have recent #1 Bill Board chart success with Crystal Waters) , David Shaw (known for his New Jersey house productions and remixes of R&B tracks in the late 80's and early 90's), and Julius Speed (aka john Camp an Atlanta based gospel ,house, and R&B session player ), Byron has delivered another incredible tune that is destined to become an instant classic. David , Sted-E, and Hybrid Heights created the original track. Together they approached Terry Burrus and David Darlington who brought their keyboard talents to bear on the project. Lastly, Byron laid his trademarked, soaring vocals over the instrumentation and the result is a tune that can be played in various club environments. This release includes their Original version, a remix by DJ Spen and David Anthony (Da Vibes) that utilizes a musical, but tough as nails approach to the song, and a high energy euro mix by legendary Chicago DJ / producer Ron Carroll providing an alternative look at the song that will help it move beyond the traditional "soulful" house market.“Candy Rain” will surely be a fixture on club dance floors and radio throughout the summer of 2017. Bert Bevans "Awesome package of mixes, Bangin!!!" Candice McKenzie "LOVE, LOVE, LOVE! Thank you Quantize!" craig Bartlett "more class from a very consistent label love it"
Deli G "Quality Release with Top Mixes, will get full support via radio and club plays"
Dj Able "nice uplifting house !! full support"
dj booker t "big tune will support"
Dj Diephuis "Soulful Fire! thnx"
dj groove "Classic vocals on some 3 am smoothness!" DJ Oji "Nice work. I like the orignal mix on this one." DJ Rob Tarter "Can't go wrong with Byron!" DJ Sir Charles Dixon "already spinning on my show"
Ed Soul (Kaya FM) "Sounds Nice!!" Evan (More House Records) "Sweet track :-)"
Geoffrey C "Ah! Now that's a soulful vibe! Great production!" Groove Assassin "Big vibes !! Loving all the mixes"
Groove CarteLL "Love the Original, definite banger!" Hector Romero "Smooth Feel good music! Nice one guys H"
Kenny Carpenter "Wow, The DJ Spen & David Anthony Mix is the best but I just love the Terry Burrus keys on the original. Great Job!" Martin Lodge "Very nice x"
Mind Street "Original and Soul Storm are our Fav"
Parrish Wintersmith "Fantastic assembly of talent in a quality package"
Paul Morrissey "Classic Byron vocal great summer feelin!" Paul Trouble Anderson "Troubsolutly my Man Byron"
richie roberts "Absolutely unbelievable release.... Spen and DA's mixes are beautiful (as always) and what Ron has done has blown my mind....a version for each part of the night!!!" Souldynamic "nice track fellas, the Spen & D.Anthony mix is choice! well done! thank you Souldynamic"
Soulfuledge "Quantize magic once again!" tedd Patterson "Very nice. Liking all versions... (original included) Spens mix will be my "go to". Full support!!"